Media captionKate Allinson (left) and Kay Featherstone: "We cook for normal people"
A cookbook by the creators of the Pinch of Nom recipe blog has smashed the record for the UK's fastest-selling non-fiction book. The Pinch of Nom cookbook sold 210,506 copies in its first three days on sale. That's 45,000 more than any other non-fiction work has sold in a single week since current records began in 1998. It also means Pinch of Nom is the ninth fastest-selling book of any description - behind novels by JK Rowling, Dan Brown and EL James. Jamie Oliver previously had the best first-week sales for a cookery book with Jamie's Italy, which sold 155,000 copies before Christmas 2005. The fastest-selling non-fiction book had been Peter Kay's The Sound of Laughter, which sold 165,000 copies in 2006, according to Nielsen BookScan data. Pinch of Nom co-creator Kay Featherstone said the success was "absolutely incredible". Featherstone started the slimming blog with partner Kate Allinson after Allinson's sister pestered them to lose weight three years ago. 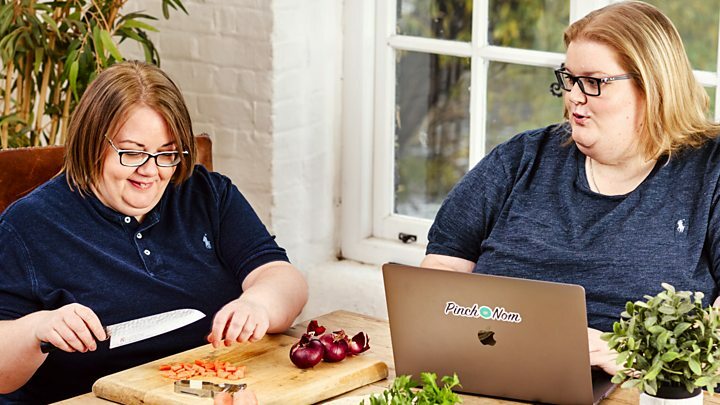 "We went to our local weight loss group and we came away kind of shocked that people just didn't know how to cook," Featherstone told BBC Radio 5 Live's Emma Barnett. "We'd previously had a restaurant - Kate's a classically trained chef - so we decided to just try to help people. But we never dreamed that we'd get here. It's crazy." Pinch of Nom now has 1.5 million followers on Facebook and 463,000 on Instagram. Featherstone said she thought their site and book had struck a chord because they were going through the same thing as their readers. "We cook for normal people. We're in our weight loss journey ourselves," she said. "We are in that struggle and we understand how hard it can be." Allinson has lost five stone since starting to try to lose weight and Featherstone has lost seven stone, she said. The meals in the book are billed as "healthy recipes that don't taste like diet food". Explaining the blog's name, Featherstone said: "It is just 'nom, nom, nom'. Because the food that we make is food that isn't diet food."